The average American family washes about 300 loads of laundry each year. Laundry rooms use more water than any other room in the home after bathrooms. It’s estimated that there are 76 million top-loading washers still in use across the country and 25 million of those are more than 10 years old. Washers built before 2003 are significantly less efficient than newer models. These inefficient washers cost consumers $2.9 billion each year in energy and water. If you have a standard clothes washer that is over 10 years old, it’s costing you, on average $210 a year. When it is time to replace your washer, consider purchasing an ENERGY STAR certified front-loading washer. These washers use about 25% less energy and 45% less water than regular washers. In addition to using energy efficient washers, there are also other simple ways to help save in the laundry room. Reuse shower towels. You don’t need to use a new clean towel for every shower you take. You are clean when you get out of the shower. After drying off, just hang your towel up to dry. It will be completely dry before you need it again. Only use the washing machine for big loads. Don’t let a small pile of dirty laundry make you feel overwhelmed. Wait until you get a big pile that you can wash at once. 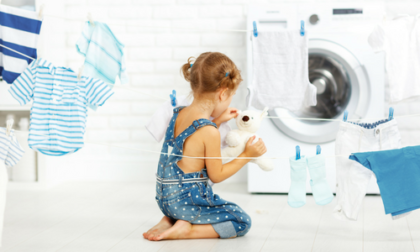 Use size cycles – when you need to run a small load, take advantage of the washer’s “small load” option/setting, which uses less water because it is washing fewer items. Just say no the extra rinse cycle – if your washer gives you the option to run an extra rinse cycle, skip this step to save water. Upgrade to an energy-efficient hot water heater. Similar to your washer, when the time comes to replace your water heater, choose an efficient model. The cost savings of using an efficient water heater will make the purchase worthwhile, not to mention you may be eligible for government rebates for tankless and solar units.